I first made these deviled eggs for Easter when I took them to a barbecue at my Aunt and Uncle’s house out on the ranch. We ate good food, hid eggs for the kids, and were entertained all afternoon by my baby cousin Belle jumping on the mini trampoline. 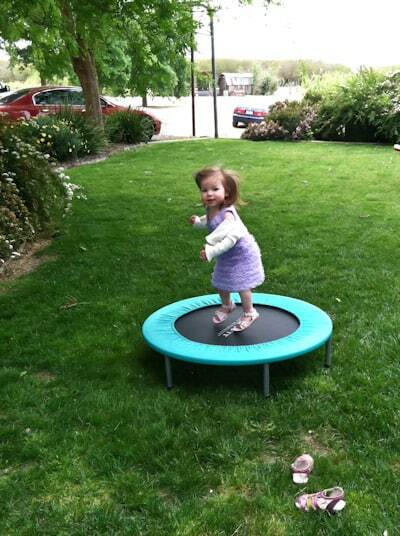 She’s not even two years old, but has already learned some trampoline tricks. The deviled eggs were a hit and disappeared even faster than deviled eggs normally disappear at a barbecue. Several people requested the recipe and after I continued to hear about the eggs for a few weeks, I decided I’d better get to work. Since I didn’t write down the ingredients when I first made them, I was forced to make them again this week. I know, poor me, forced to eat Chipotle Bacon Deviled Eggs again. It’s a rough life being a food blogger. The first time I made them, I used canned chipotle chiles in adobo sauce, but this time I decided to try using my McCormick Gourmet Chipotle Chile Pepper. It worked great! This recipe is basically just a variation of my basic deviled eggs. The main changes are that I added the chipotle, some garlic powder, and of course the bacon. Although I’ve always said that I don’t like to add extra “stuff” to my deviled eggs, I have to agree with my family that these are delicious – especially with extra smoked paprika sprinkled on top! I have been chosen by McCormick to participate in the McCormick Real Gourmets program. I have been paid by them and I received a big box full of McCormick Gourmet spices. I have been using McCormick Gourmet for years, and am thrilled for the opportunity to explore more of their spices and blends. I used McCormick Gourmet Chipotle Chile Pepper, garlic powder, and smoked paprika to create this deviled egg recipe. Cut eggs in half. Arrange egg whites cut side up on a serving plate and put the yolks in a small mixing bowl. Mash yolks with a fork then stir in mayonnaise, mustard, vinegar, chipotle chile, and garlic powder. Mash and stir all ingredients together well. Stir in chopped bacon, reserving some pieces to garnish the top of the eggs if desired. Taste and add salt if necessary. I found that these were salty enough with the bacon added, but it depends on your taste. Spoon some of the filling into each egg white half, dividing the mixture as evenly as possible between the eggs. Sprinkle eggs with smoked paprika and garnish with bacon pieces. Serve immediately or refrigerate until ready to serve. Those look amazing, even with leaving out the bacon, since I don't eat meat. I feel like real paprika barely even tastes, but smoked paprika really adds a deliciousness to savory dishes! They look absolutely stunning. Thanks for sharing the recipe. I'm so making these today. I *might* share some with my husband, if he's lucky.Your cousin is absolutely adorable! I ate the last of them for breakfast today. They are good even 3 days old. Agreed - looks great!I wonder what pancetta would be like in there? Too salty? Too crispy?? Or pure heaven? 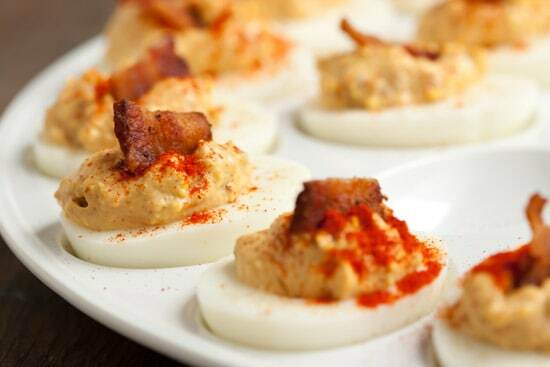 How I love the idea of putting bacon in deviled eggs. As if they weren't devilish enough! Ah yes, poor you, having to make these all over again! 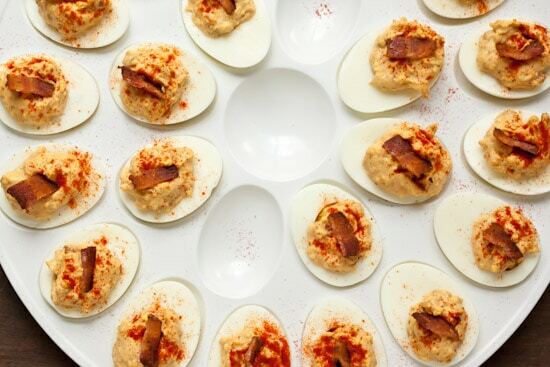 Everyone loves deviled eggs and these look even more delicious than the usual fare! I love sliders that are on the spicy side, but never thought of adding bacon to the mix. Sounds wonderful. I love deviled eggs but this takes it to the next level! How many canned chipotles did you use the first time you made them? You would think with me being the big bacon lover I am, that I would have thought to put a piece of bacon on my deviled eggs before. Awesome! Haha. Funny that you say that everybody was so crazy about the eggs. Once I did filled eggs for a party and everybody loved them as well. There seems to be some kind of magic about it.The Deviled Eggs look yummyyyy! These eggs are going to my next BBQ. Chipotle and bacon? These are definitely kicked up deviled eggs! Oh, am going to try this!!!!! Mouth watering, they look awesome. My eggs are boiling as we speak.